Drawer microwaves offer cooks tremendous flexibility and easy access to freshly heated food. Rather than working around the hinged door to remove a container, you simply open the microwave drawer and lift food straight up and out. Although most people are more familiar with countertop or over-the-oven models, microwave drawers are a great option for those with specific kitchen space requirements. Our top pick is the Bosch HMD8451UC 800. We love its sleek style and simple, crisp layout. The push button open and close feature is convenient when you’ve got your hands full, and we don’t miss the turntable at all. The Bosch is a top-quality pick that will make cooking a breeze. Why Buy A Drawer Microwave? While most of us have become accustomed to countertop microwaves that are also considered portable, it’s important to note that these tools are generally fixed in place and can take up a lot of precious counter space. Countertop units can also negatively impact the traffic pattern in your kitchen if you have multiple cooks. There’s generally only one way to open them, and moving hot food from the microwave to countertop to table can put several people at risk of injury if your kitchen is crowded. Finally, countertop microwaves can be a hassle to clean, particularly if you’re tall. Monitoring spatter and mess inside your microwave can require a great deal of bending to scrub the inside of the unit with any accuracy. Short cooks with wall mounted microwaves may experience similar challenges. Moving hot food over your head or scrubbing your microwave from a stepping stool adds unnecessary danger to the process of cooking. Drawer microwaves are available in a variety of widths, from 24 to 30 inches wide. Most will accommodate a 9 x 13-inch baking pan and can hold a latte cup. A top-loading microwave makes it easier to get a safe grip on a hot baking dish or bowl, and the smooth action of the drawer will keep things stable. The drawer heights are generally set at a standard countertop height, so the control buttons are at a similar level to your dishwasher. The Sharp KB-6524PS is a 1000-Watt microwave oven available in 24-inch and 30-inch models. 1000 Watts is more than enough power to heat almost any dish quickly – as long as you’re willing to rotate it – and the oven-style towel bar is unique among the models we recommend. The drawer slides out smoothly about a foot and a half from the unit and there’s plenty of space for a full-sized plate or a casserole dish. SEE ALSO: Can You Microwave Glass? While things are roomy, the drawer itself isn’t waterproof. You’ll have to be extra careful when microwaving liquids to make sure they don’t spill over, as you run the risk of wetting the electronics in the bottom of your microwave. No turntable? It has several of the normal amenities: sensor cook modes, a plethora of presets, and even a button to open the door, but there’s no way to rotate your food automatically. Instead, the entire cooking apparatus rotates internally. In practice, this is better than having a turntable, but it’s also a lot more mechanically complex. Be extra sure to review the warranty and save your receipts and packaging. It’s important to note that Sharp manufactures all of the electronics found in drawer microwaves of almost every brand (Dacor, Viking, and Wolf). This means that you’re stuck with a similar set of issues, no matter which brand you choose. Overall, the Sharp KB-6524PS is a functional drawer microwave with all the electronic features you’d expect from a modern appliance. While the non-waterproof drawer leaves something to be desired, we’re pretty happy with how the towel bar works and we’re confident that the guts of this microwave are pretty similar to anything else on the market. The Bosch HMD8451UC 800 is a 950-Watt, 24-inch microwave. It has all the electronic modes you’d expect; sensor cooking, multiple power levels, and a timer, and opens and closes with the touch of your hand. There’s a “keep warm” function to keep food toasty for up to half an hour without overcooking it. Like the Sharp microwave drawer, this unit doesn’t have a turntable. Bosch recommends that you rotate food by hand and leave some time for heat to spread evenly throughout your food, so we’re pretty sure there’s no fancy rotating heating element here. With less moving parts, there’s less stuff that can break inside this microwave. To prevent damage to the unit, the drawer has a locking feature to keep it fixed in place while you clean it. The door itself is a bit touchy. It pays to be extra careful when installing this unit, as the microwave won’t turn on unless the door is solidly closed. Make sure you don’t try to slide your microwave in too deep and prevent the door sensor from making contact. Unfortunately, there’s no illumination on the panel, so you’ll have to turn on a light during any midnight hot cocoa runs. 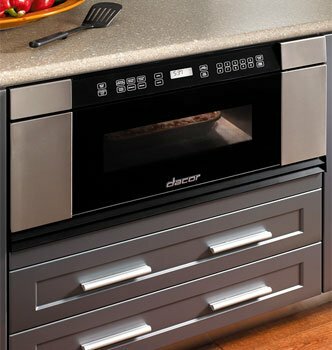 The Dacor MMD30S is a 30-inch drawer microwave with a 950-Watt heating element, sensor cooking modes, and smooth drawer operation. If you’re a fan of the sleek metal styling, it may be a great alternative to any of the other models we review. Like many of our other recommendations, this Dacor has a 30-minute stay warm feature and a bountiful array of programmable modes. Notably, you can set it to perform up to four cooking operations in sequence or even have it start automatically at a certain time of day. This is pretty handy in theory since it makes cooking multiple dishes at once much simpler. You can set up the microwave and then pay attention to the range or oven while it goes through a fully programmed sequence. If you find yourself cooking a lot of dishes with variations in microwave power level or you think you’d get a lot of use out of a delayed start, this might be the best model to choose. The Wolf 24″ drawer microwave has a 950-Watt heating element, like most of our picks. It has sensor cooking modes, programmable sequential cooking, and a timer that goes up to 90 minutes for extra-long operation. This is handy in conjunction with the keep-warm mode, allowing you to keep your food ready to eat for a bit longer than most of our other picks. Price and aesthetics should be pretty big factors when it comes to choosing a drawer microwave. Luckily, this Wolf is especially attractive. The burnished control panel is spaced out across the entire top of the unit, giving it a unique appearance which should fit well in many kitchens. Wolf offers an especially nice two-year warranty on this microwave, covering both parts and labor for any defects that could reasonably be blamed on the unit. The Viking under counter drawer microwave is 24-inches with 1000-Watts of power. It has a 30-minute keep-warm feature, sensor cooking modes, button operated opening and closing, and a two-year full warranty. It also has the same sequential cooking feature as most of our other picks, making this a great choice for anyone who cooks complicated dishes in a busy kitchen. Like the Wolf above, the Viking has a two-year warranty on the whole microwave and five years of coverage on the magnetron tube. 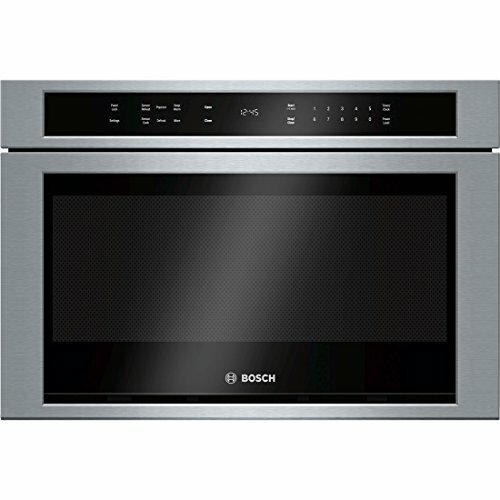 It has similar styling to the Bosch and Dacor, with a tasteful blend of black controls and polished stainless trim. Like our other picks, this unit doesn’t have a turntable. You’ll have to manually stir and rotate dishes as you cook them. Viking’s other products offer many of the features of professional-grade appliances for your home kitchen. However, we’re not sure that this microwave is substantially different from our other picks. It’s not dramatically more powerful, the sensor cooking modes aren’t any smarter, and the internals are made by the same company. This means it’s pretty comparable to most other options. Experts recommend a dedicated grounded or three prong outlet high inside the cabinet at the back so you can access the plug if needed. While the unit contains drawer glides for smooth movement of the microwave base, you’ll need to have a sturdy and supportive shelf with a tolerance of 100 pounds. Drawer microwaves are generally 24, 27 or 30 inches wide, so if you have stock base cabinets, you should be able to find a spot for your microwave fairly simply. However, be prepared to hire a carpenter for any additional framing you need to build if your cabinets are custom-built. Ideally, your drawer microwave could go into a new kitchen island built for the needs of your drawer microwave. It should be noted that drawer microwave units don’t offer homeowners or kitchen designers much “wiggle room” in terms of cutting the cabinet to mount the drawer microwave unit. The front flanges on these units generally offer less than an inch of cover over the hole cut for the microwave. Measure carefully! You’ll need to make certain of the depth of your base cabinet. If the drawer microwave you want is too long to fit into your cabinet, you may need to remove the cabinet backing or trim away at the wallboard behind your base cabinets before installing the drawer microwave. This crucial requirement, along with running or pulling wire and placing an outlet for your microwave, doesn’t make this an easy project for a do-it-yourselfer. Depending on the space in your kitchen, you’ll want to consider handle depth on the front of your microwave. As previously stated, some microwaves just pull out like a drawer, with a handle that’s similar to an oven door handle. However, others open at the push of a button. Unless you’re trying to match your drawer microwave to your stove, a flat-fronted unit may be more desirable so there’s no clashing with your cabinet hardware. Of all the tools that park on your countertop and eat up precious space, microwaves are often the largest. While drawer-mounted coffee pots are not feasible, these drawer microwaves offer fans of open counter space an ideal choice. If you’ve ever microwaved a dish that barely fit, you’ll recall how difficult it can be to then remove said large – and generally hot – pan. Getting a safe grip on large containers to remove them from a microwave can be a dangerous challenge when you’re reaching from the side. However, from the top down, this is much easier. A wall-mounted or countertop microwave can be nearly impossible for children learning to cook, and short adults can also struggle with higher configurations. If you’ve ever tipped a hot cup of coffee or boiled homemade caramel sauce all over the inside of your microwave, you know the challenge in cleaning up a hot – and possibly sticky – mess. It’s nearly impossible to sop up all the hot liquid from the far back corner, and the longer things cool, the harder they are to scrape away. Easy access to the drawer bottom and glass front for a thorough cleanup of spills. Freedom from the awkward “bend, wipe, look, bend, wipe some more” pattern of trying to clean a microwave. 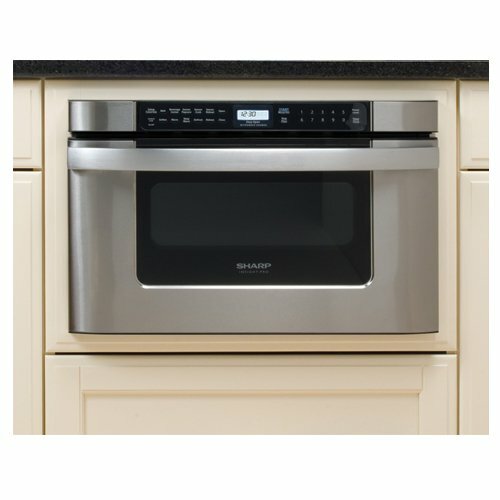 Many higher-end stove manufacturers also offer a drawer microwave. If your dream kitchen is in the planning stages, consider choosing a stove and drawer microwave pair that will look and work great together. Drawer microwaves are an ideal pick for cooks of all ages and heights. However, they do require specific cabinet supports, a custom cut at the front of the cabinet, and special power access. Also, these units are generally more expensive than over-the-range microwaves and much higher in size than many countertop units. If you’re building a new kitchen or renovating an existing space, a drawer microwave can be an elegant addition to the space and allow you to show off your beautiful new countertops! Consider our favorite unit – the Bosch HMD8451UC 800 – when you scan our reviews. With 10 pre-set programs and handy features like sensor cook, defrost and child lock, you’ll be cooking up delicious meals in this beautifully designed microwave drawer in no time.